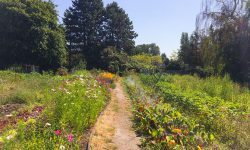 The Farmers on 57th grow food, flowers, herbs and community in Vancouver, BC. We grow on the grounds of George Pearson Centre, a Vancouver Coastal Health facility. Home to 100+ people living with disabilities GPC is on 57th Avenue, near Cambie St in the South Vancouver neighbourhood of Marpole-Oakridge. Welcome! Garden Club Update at the George Pearson Residence! Market Garden – Halfway Through our Summer Season Already!